Since dropping Mark off in Tahiti last week, life has been pretty busy. It started on Thursday, when we needed an early start, even though Mark’s plane didn’t leave until 11pm at night. Some last minute preparations onboard were followed by a lift to the rainy ferry dock. Our Tahitian friend Pierrette was so kind to drop us and our heavy load off with plenty of time to catch the 9am Terevau to Papeete. This boat is faster and cheaper than the Aremiti ferries, and it runs on time! Once in Tahiti, a van from Hertz brought us to the airport, where we hired a car for the day. Then, we needed to buy a fiscal stamp at the post office (9000 XPF), in order to pay for Mark’s residency card extension, which needed to be arranged at the Haut-commissariat office in Papeete before 11:30am. All went well at the Haut-commissariat de la République en Polynésie française and Mark can now legally enter the country again, if he needs to come back soon. The reason for our car rental, unlike other times, was solely for our own conveniences, to store all the luggage and have a little refuge for the (wet) day. We had seen the sights of Tahiti Nui on several occasions, so to kill time, we drove out to Tahiti Iti, the southeast peninsula of the island. We hoped to eat our lunch at the top of a mountain, but when we missed the unmarked roads to this belvedere, we ate our sandwich in the frontier village of Tautira instead. Tahiti Iti is much quieter than its bigger brother and we enjoyed the relaxed atmosphere. Mountain cliffs rise close to the road, and multiple waterfalls plummet along its edges. When we finally found a road to the summit, rain clouds had enveloped it and the view was non-existent. The temperature was a lovely 73°F (23°C) up there, so we savored the cool climate for some well-needed rest. We were not in a hurry. When happy hour came along, we met our friends Christian (SV Pitufa) and Valentine and Tor (SV Yum Yum) at Casa Bianca in Marina Taina. It was great to catch up with them and we had a lovely final evening in the tropics for Mark. The last ferry to Moorea had long departed, so I spent the night at anchor on Pitufa. 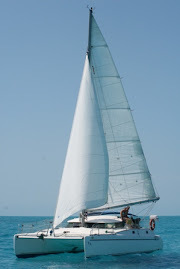 It took a while to get used to the rolling motion of the monohull and to be “at sea” again. Irie has been in a marina since April and we spent two months on land in New Zealand, so I have long lost my sea legs! After Mark left to Boston, I have had a few adventures of my own. I met the owner of our previous boat Four Choices in Papeete, which brought back memories. He showed me around our old boat and images of nasty boat projects, comfortable marina life with a view of the Golden Gate Bridge in San Francisco and our dogs Darwin and Kali sprang to life. We owned the boat in California for 9 months and lived on it full time for five, before we set off towards Mexico in September 2005. 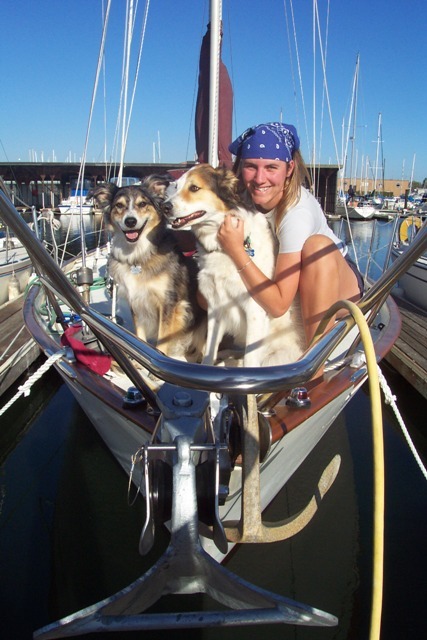 The dogs hated the heeling in the Pacific, I was horrendously seasick and the first day out caused a rip in the mainsail and engine trouble. So, after two days – we had only reached Monterrey – we put the boat up for sale and a whole other adventure ensued. The following morning, I got up at 4:30am to catch the 6am ferry to Tahiti with some gear to sell at the flea market in Marina Taina. It was another drizzly day and not a lot of people showed up, but it was another event I could mark off the list. Sunday, the Moorea Rendez-vous party in Cook’s Bay concluded a series of Puddle Jump 2015 events and I decided to check in and see what the hype was all about. Mark and I crossed the Pacific Ocean two years ago, but were never involved with the Puddle Jump crowds. The atmosphere and attendance was overwhelming! I stood by and watched the activities, while meeting up with the crew of Four Choices again and hanging out with a Dutch single hander. The rides there and back while hitchhiking proved to be interesting as well. Driving through pastures in the hills - yes, this is Tahiti! Sharing a 1/2 meter pizza with Christian - the right amount for 3 people! Meeting Bob and our old boat Four Choices - she still looks the same! I have never seen this many cruising boats and dinghies in pretty Cook's Bay! Pierrette showing one of her quilts - they require heaps of work! Every little colorful piece of fabric is hand-sewn to the other ones. It is a beautiful day in Vaiare today - the first one in a long time! Tahiti across the channel today: no cloud in the sky on this crisp, sunny day! On June 8th, Mark and I traveled back in time with a plane from Auckland, New Zealand to Papeete, Tahiti. We arrived late afternoon on June 7th, with plenty of time left to catch a ferry back to Vaiare on Moorea, where Irie is docked in the marina. Clean, roomy, welcoming and in great shape, she was waiting for us med-moored and safely secured (this is the first time in eight years we didn’t have to worry about her while being away!). Such a shame she hasn’t sold yet. At $129,000 (negotiable) this boat is a good buy and the difficult part – the Pacific Ocean crossing – is taken care of already! On our last day in Auckland, Mark and I took a little daytrip by ferry into the Hauraki Gulf. We set foot on Rangitoto Island, the youngest (600 years old) of the city’s 50 extinct volcanoes. The weather wasn’t all that good, but we managed to explore the island reserve (nobody lives there) by doing a few drizzly walks and hiking to the top. The view over the harbor, the city and the surrounding islands was pretty sweet. Back in the flat, it was time to pack and enjoy the landlubber lifestyle for one more night. Mark and I were hoping that Irie sold during our two month stay in New Zealand, because we are finished with the cruising life for now. Since that hasn’t happened yet (“location, location, location” is relative - Irie is located in a gorgeous location, but she is basically laying in a paradise in "the middle of nowhere" for people to check her out), we needed to make new plans. The Wirie business is thriving and Mark has (and wants) to be in the United States, so we have booked plane tickets back to Massachusetts. He is leaving Irie on June 18th, while I wrap a few more boat related things up and plan to further explore Moorea. After saying goodbye to our dependable and amazing floating home of eight years, I will get on a plane and arrive in Boston late on July 4th, after the Independence Day fireworks display. Volcanic rock - a lot of it! The day - and our stay in New Zealand - ended with the sight of a sailboat race.